The chancellor has defended raising the top rate of income tax to 50%, saying it was only fair that those with the "broadest shoulders" paid more. 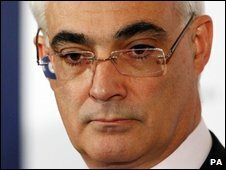 Speaking to the annual convention of the Institute of Directors, Alistair Darling said no chancellor wanted to raise taxes unless they had to. But because of the "extraordinary circumstances" of the recession, it was necessary to raise revenues. He said he still wanted people to see the UK as a good place to do business. In Mr Darling's budget, presented on 22 April, he raised the rate of income tax on those earning over £150,000 to 50% from April 2010. Along with other measures affecting the wealthy, the chancellor said he hoped to raise an additional £7bn per year to help close the huge budget gap, which is predicted to reach £175bn this year. I don't think there's a single item of government expenditure that you can't say: let's have a look at it, do we need to spend this money, can we spend it better and more efficiently? Mr Darling told business leaders that in times of difficulties it was fair to make the rich share the burden. "I think it is fair to ask those with the broadest shoulders to shoulder some of the strain because every one of us, at the end of the day, has an interest in making sure that as a country we have sustainable public finances in the medium and in the long term," he said. The new top rate of income tax had earlier been criticised by Institute of Directors (IoD) director general Miles Templeman, who said it sent out the "wrong" message. He said the IoD was instead calling for a 5% reduction in civil service staff. The chancellor said the government was aiming to make the public sector more efficient by making savings of £35bn. "I don't think there's a single item of government expenditure that you can't say: let's have a look at it, do we need to spend this money, can we spend it better and more efficiently?" said Mr Darling. "And that is something that we are going to have to do." In his Budget statement, the government said that current public spending would fall by 0.1% annually from 2011 to 2014. However, it has not given details of where the budget cuts, or efficiency savings, will fall. Speaking later before the Treasury Committee of MPs, Mr Darling defended his decision not to offer wage subsidies to firms in all sectors of the economy. "It is something other countries have been doing... but the risk is that if an employer thought the government would step in, they why not reduce your wages?" he said. Mr Darling said he instead considered that it was better to help specific industries, such as the car sector, which he is assisting through the implication of a scrappage scheme. This will give motorists a £2,000 discount on new cars if they trade in vehicles older than 10 years. Mr Darling also reiterated that the government was confident it would sell all the £220bn of new bonds it is issuing to help fund the public sector deficit. The chancellor also defended his economic forecast, which predicted that after declining by 3.5% this year, the economy would revive next year and grow by 3.5% the year after. "If you look at the figures right now, quite frankly they are mixed," he said.